You are getting - 5pcs total 2 of them are Custom seat levers (The bigger ones on the pictures) and 3 of them are custom door locking pins 2 front doors and one trunk door (The smaller ones on the pictures) they are replacements for Suzuki Jimny/Vitara/Grand Vitara. You can choose different lever/logo colors and a different door locking pin style as you wish just contact me first! 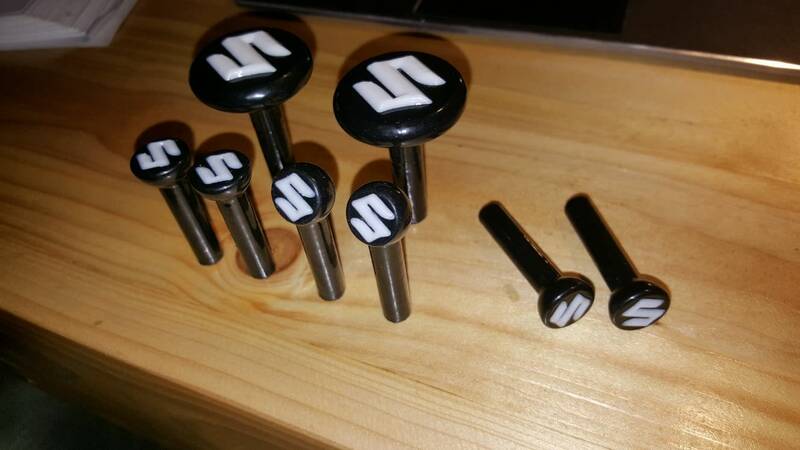 Please note that there are 2 different designs for door pins one is flat top and one is diagonal top (refer to the pictures) both designs have the logo on top. There is only one design for the seat levers and it's the flat big one on the pictures. Picture is only for reference the total amount is 5pcs. If you won't contact me I'll assume you want black color for body with white logo and a diagonal door pins design I'll send it by default.